We pulled up in Amsterdam and the ground engineer called us down to have a look at something - Turned out the castelated nuts that hold the bolts that hold the pushrods didn't have the split-pins installed, so the nuts eventually undid themselves and one of the bolts fell out in flight. When we put the gear down, the rod fell down and as the gear door came up the rod slid up the inside until it caught and then pushed itself right through the door. If you look carefully at the bolt on the left in the photo on the right, you'll see it has no retaining nut on it - it's falled off and the bolt is not far from coming completely out. We checked out the other three big pushrods and found that the nuts were also loose on the other gear door, and the other pushrod on the same punctured gear door had no nut on the bolt, so it was about to fall out as well. 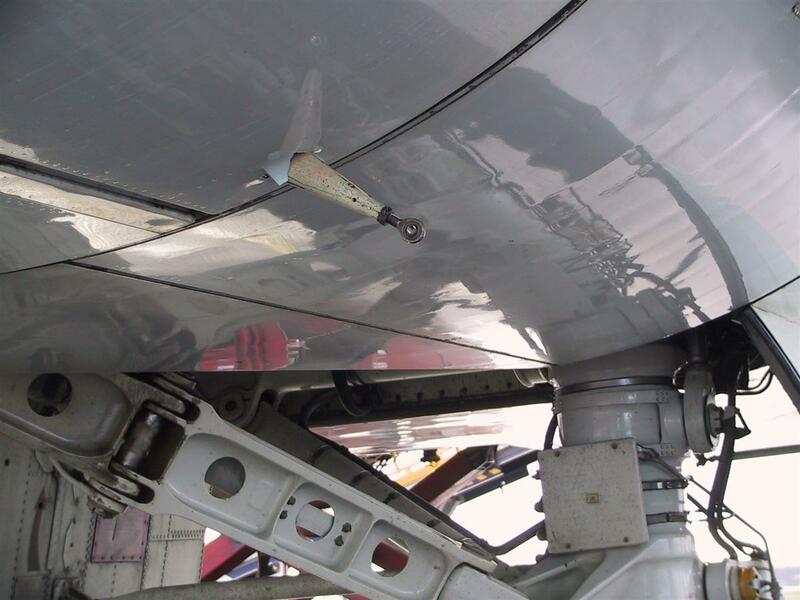 The reason was that it was from when the 747 was last serviced in China, they missed out on fitting the split pins to lock everything in place. 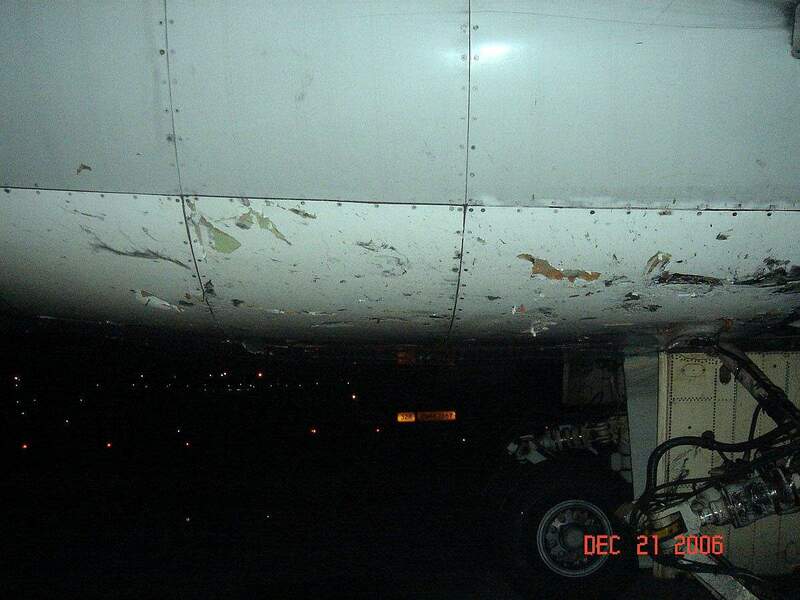 I've only ever had one potentially nasty incident in the 747, and that was when one of the tyres blew-out on takeoff out of Shanghai. 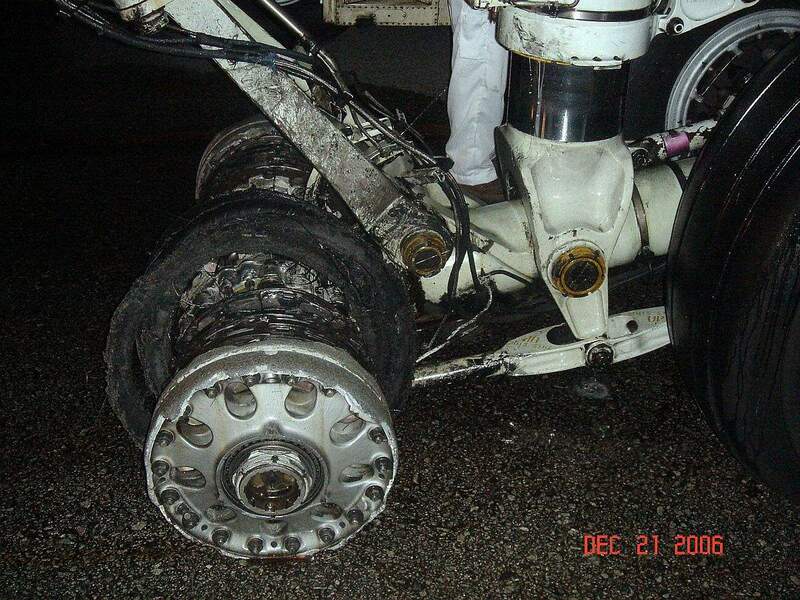 Because the 747 is so large, you can't really feel a tyre or two let-go, and so I missed the slight vibration completely and the first we knew of it was when the control tower asked us if "comfirm operations normal, on takeoff your landing gear make smoke and maybe fire!" Everything was normal at that point, so we kept going to our destination of Penang. But the tower soon made it evident that we'd left a lot of debris on their runway. And so did every other frequency that we talked to on the way back to Malaysia. So I decided to divert to the much larger runway at Kuala Lumpur, as being longer it gives you a better chance of stopping safely, they have far better fire & rescue service, and the company has a maintenance base there. 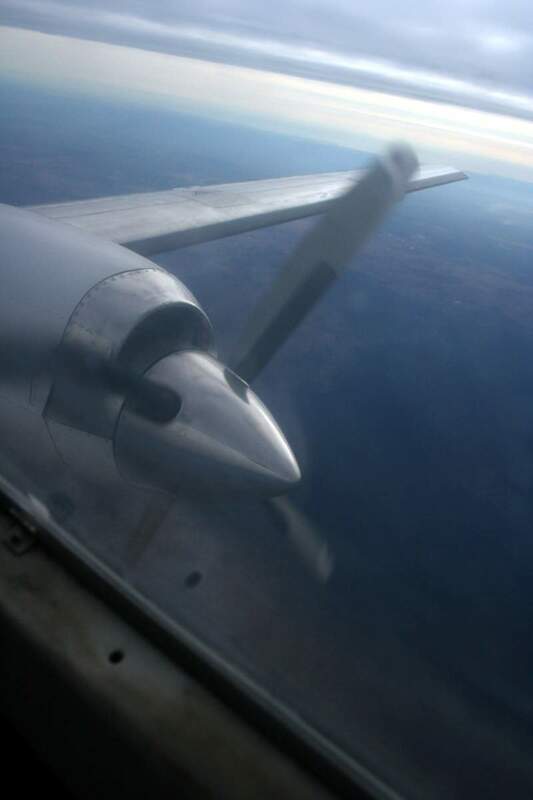 We flew around to burn off about ten tonnes of fuel to reduce the landing weight as much as possible, then made our approach. 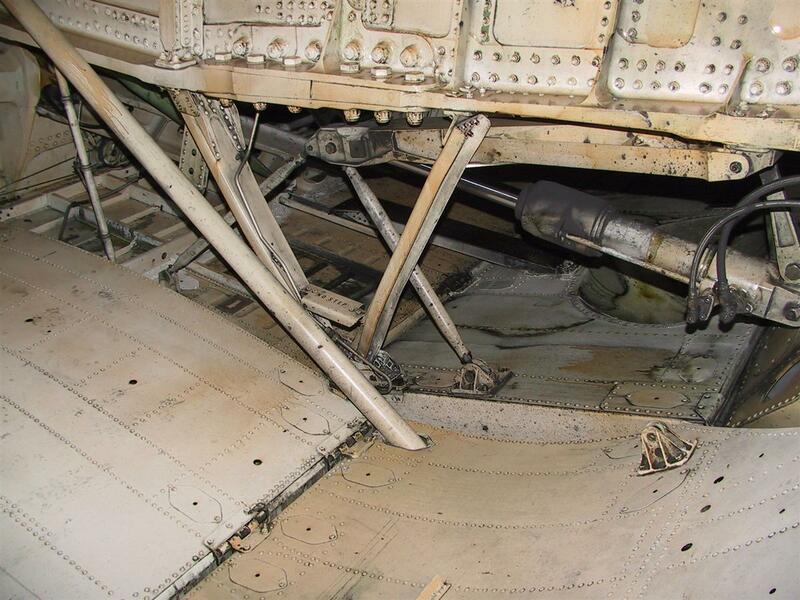 We'd had a good few hours to think about all the possibilites before landing and I decided to mainly use the left brakes as we weren't confident that the right-hand ones had good hydraulic lines. 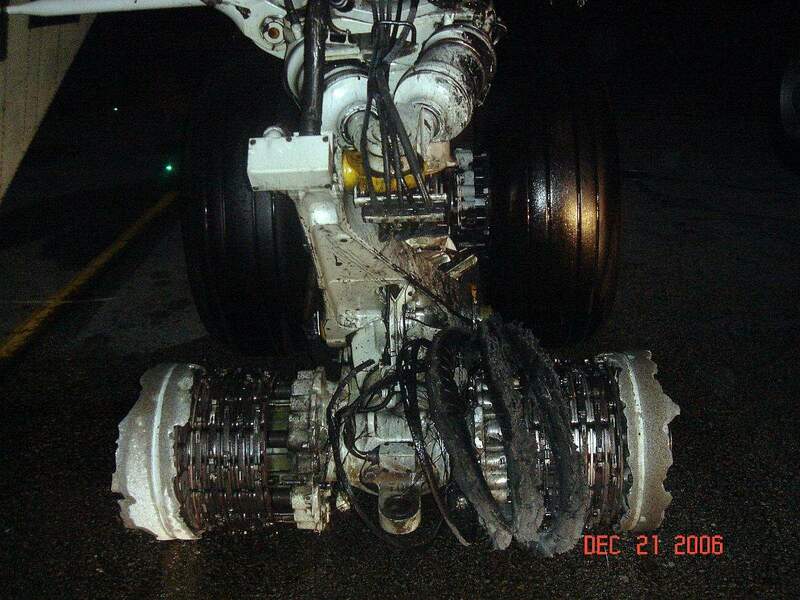 All four hydraulic systems showed good pressure, but I was sure that when the tyres & wheels disintegrated on landing there would be additional damage. I'd also planned to get off the runway on the last high-speed taxiway to the right, to try to keep the runway clear as I figured that the big plane would be stuck in place after we stopped. It all went to plan, and we made a completely normal landing and I pulled up exactly where I wanted to. 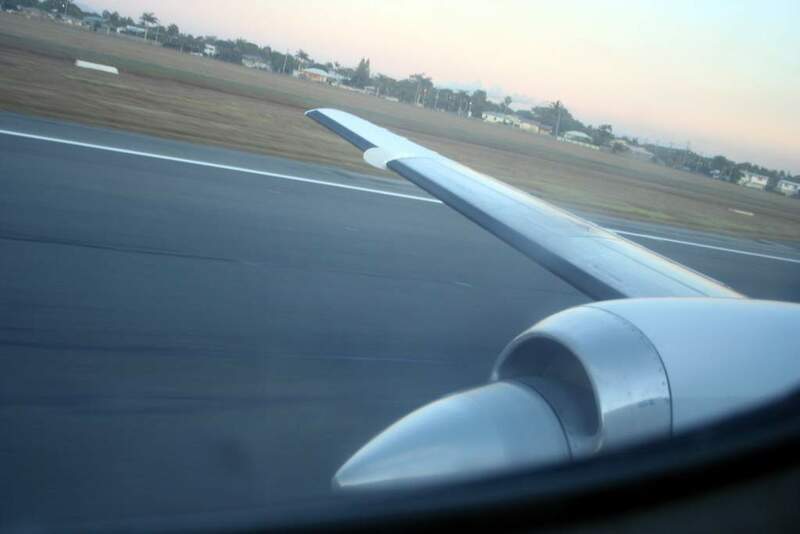 The plane even felt quite normal on landing and if we hadn't have known in advance about the tyre problem I probably would have taxied all the way to the gate. 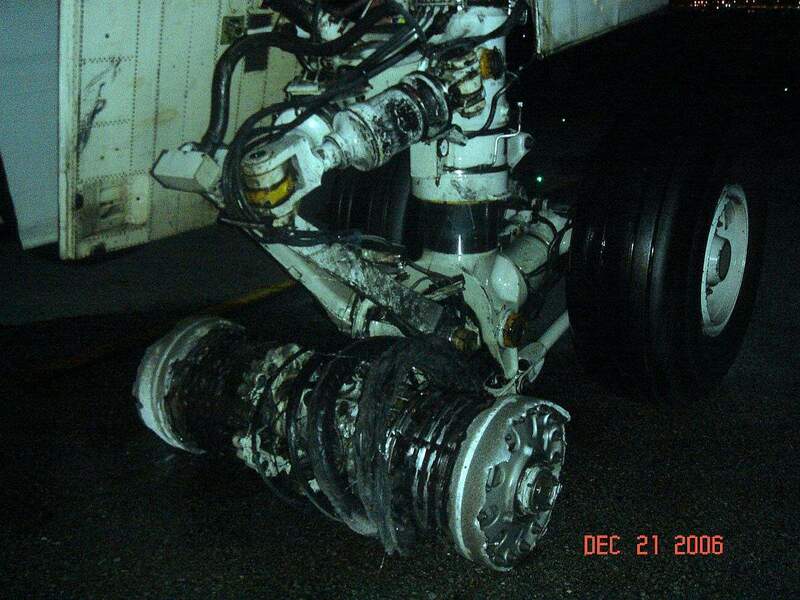 Anyway, as it turned out on landing the rear pair of tyres & wheels on the right-hand body gear on the 747 shredded themsevles, and chunks of wheel flew all over the place. 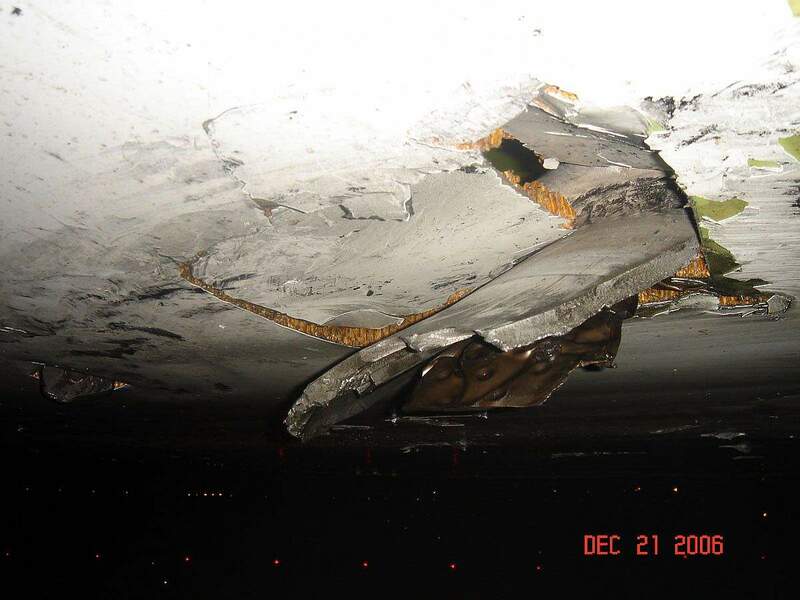 The wheels were ground down to the diameter of the brakes, and if you look at the photo above & right you can see a chunk of wheel embedded into the fibreglass fairing below the fuselage. 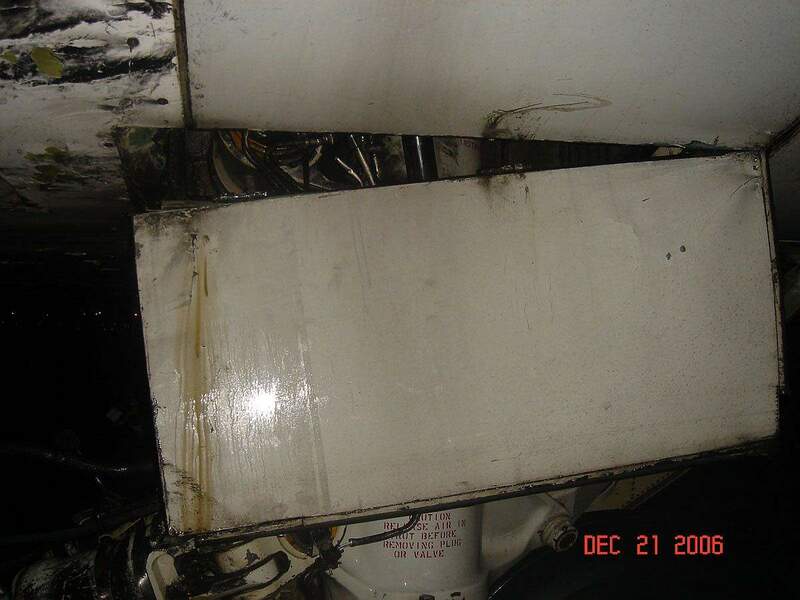 Other chunks of wheel punctured the fuselage and were picked out of the freight! 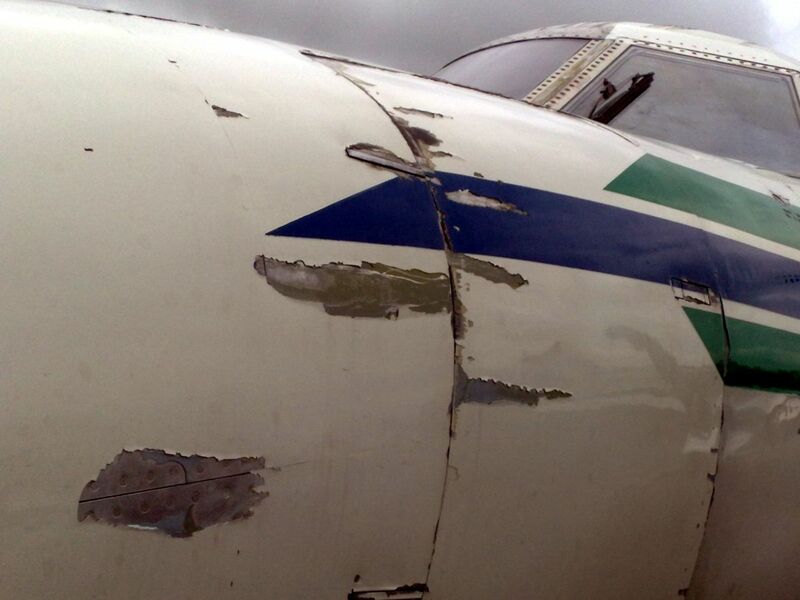 It's a testament to the strength of the 747, it took all that damage and after a week or so getting repaired it was as good as new. 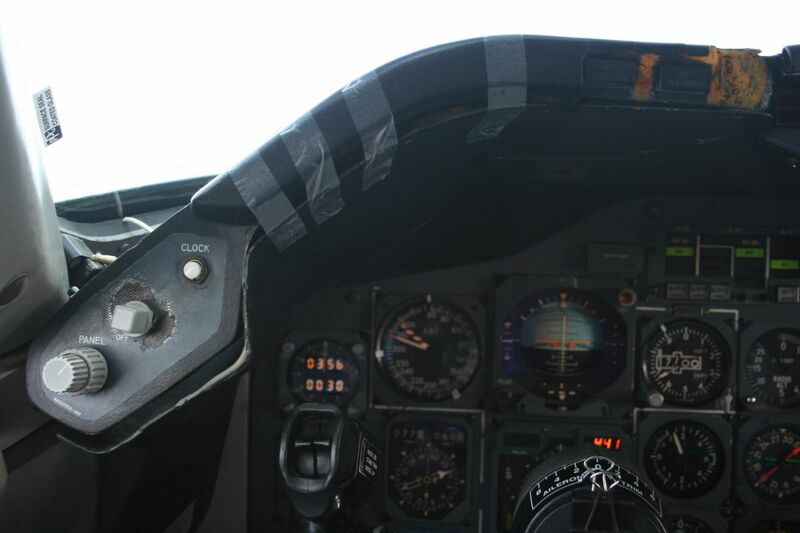 Because the public doesn't travel on the freighers they sometimes aren't a neat & tidy as the passenger aeroplanes are ... On the left you can see how one of the other pilots has taped part of the dash on to stop it from falling off. 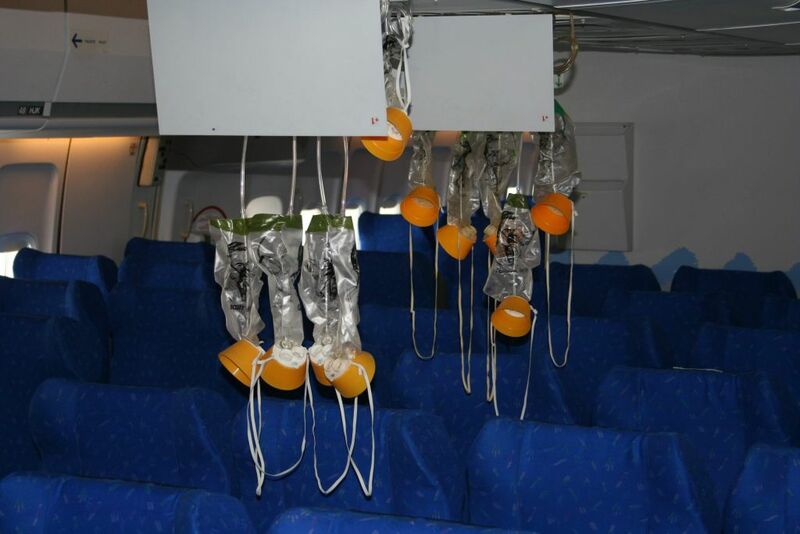 On the right are some oxygen maks that have either fallen down on a rough landing or are out for servicing. That's what they look like when they're dropped intentionally, and if they all come down it looks like the roof is falling apart - It's called 'the rubber jungle'. I ended up quitting the job with Air Atlanta Icelandic in late 2007, as I wanted a job closer to home and I wasn't confident that they'd be around in a year or so. 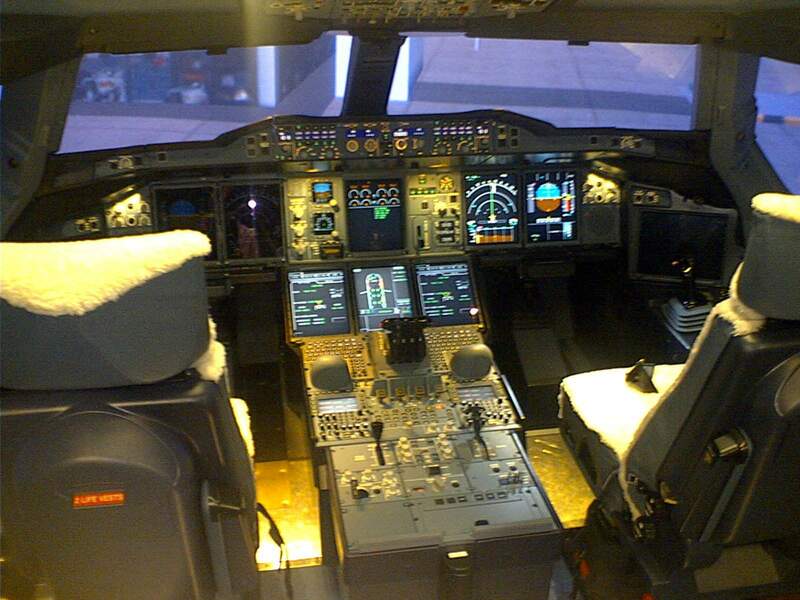 I had an interview with Qantas for the position of an Airbus A330 simulator instructor. It was based in Sydney and so much closer to home, so I had high hopes for it. 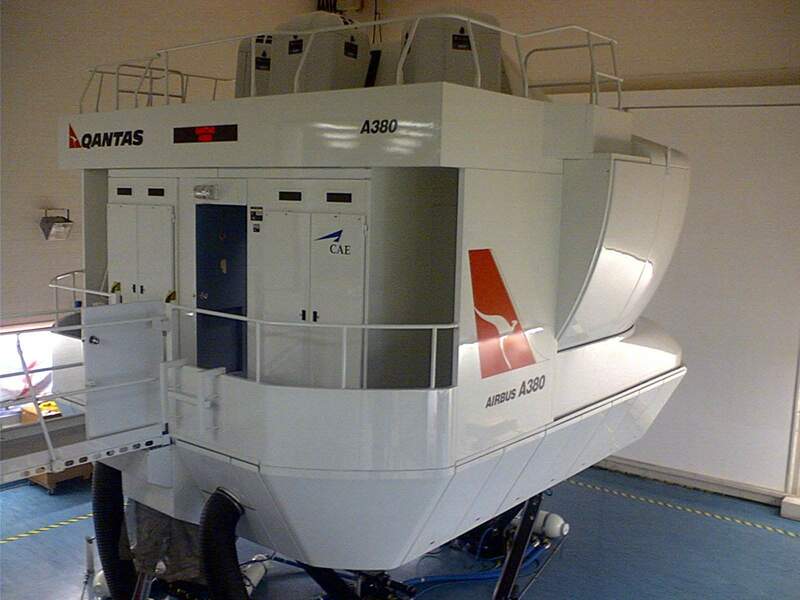 In the two photos left & right here is the Airbus A380 simulator that Qantas had to prepare their pilots for the new plane. 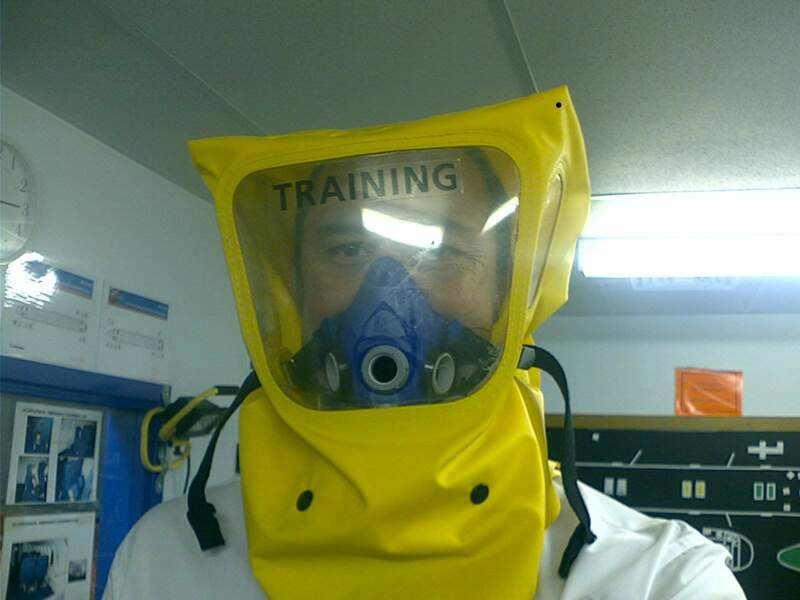 We had to do the standard aircrew emergency procedures, and one of those was to wear the smokehood, used for fighting fires - I took a photo just for laughs. It ended up that I wasn't going to be able to get home as much as what I wanted to, and the actual working conditions weren't what I thought they'd be. But the main reason I quit was that I decided that I was needed at home to look after my aging father, and so in late February 2008 I quit. 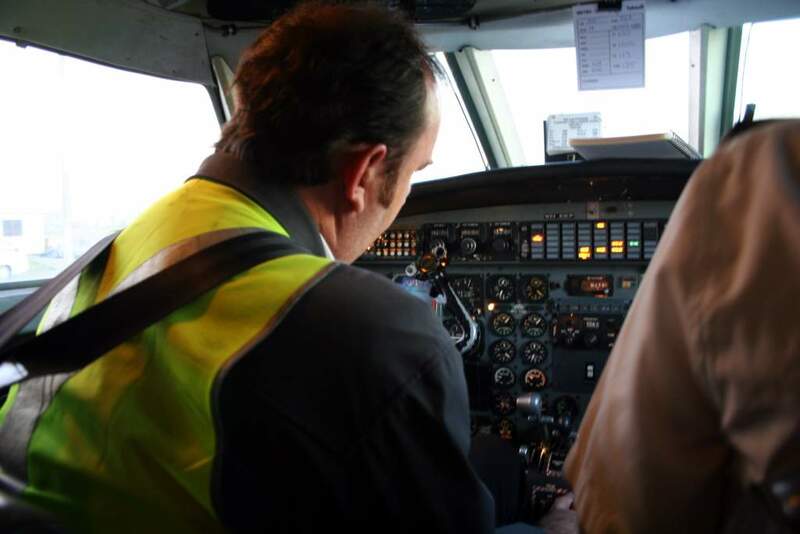 I tried to get a few jobs, but with money running out I had to fall back on my old job of flying Metroliners in night freight. So I'm back to near where I started, but that's okay as I spend a fair bit of time at home It's a huge pay cut from what I used to get but I'm needed at home to look after my father. 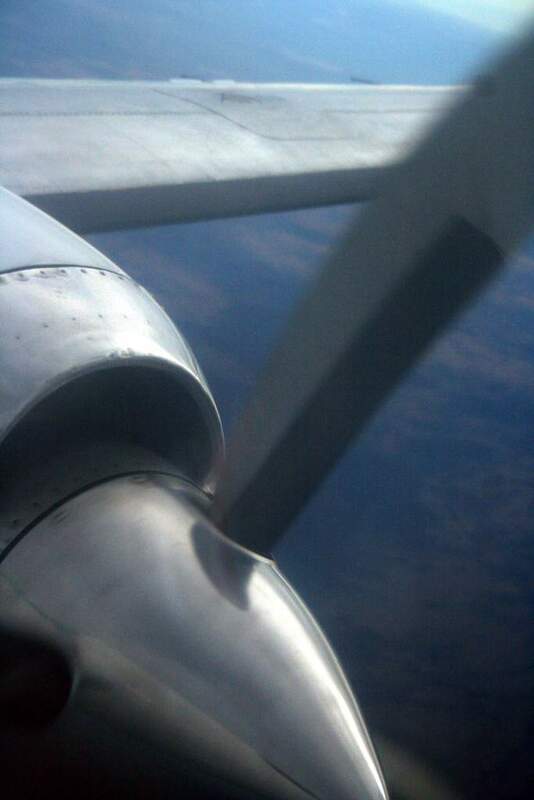 On the left is me starting up the left engine, the right already running. One the right is during takeoff, with the water/methanol injection into the engine running. (unfortunately you can't see the fluid spraying in here) This increases power on takeoff when you're heavy and/or out of short runways. On the left we're passing 4,900' climbing to a cruise at 19,000'. 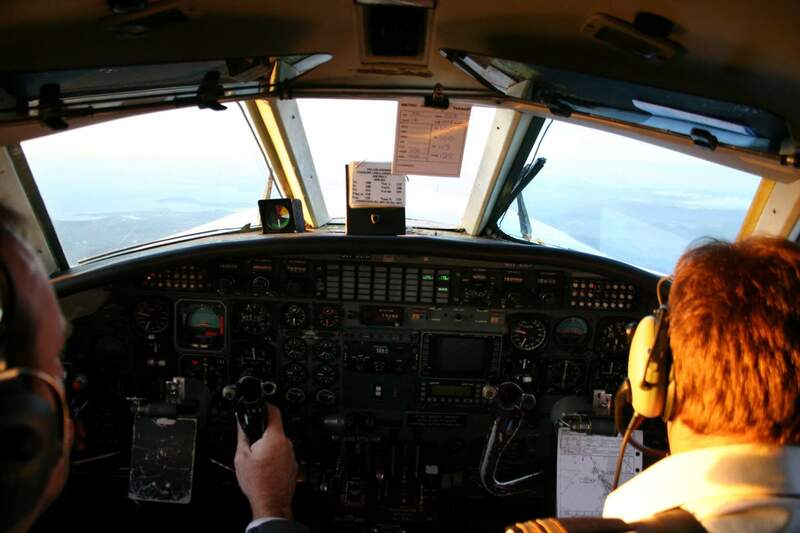 The Metros I fly have no autopilot, so they have to be hand-flown the entire time, and they are not terribly stable so tend to wander left/right and up/down all the time. 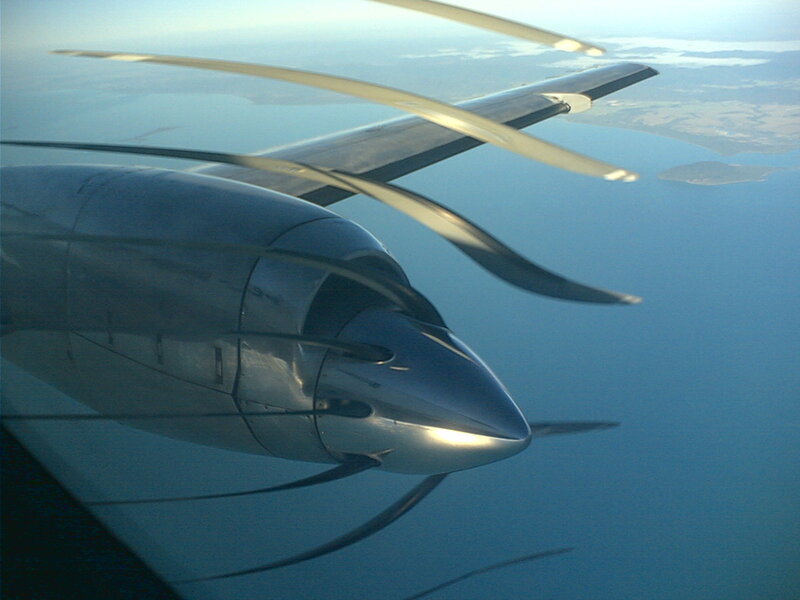 On the right is the left-hand prop during cruising flight, and if you look carefully you can see the pitch of the blades. A couple of photos with me mucking around with the camera - On the left is one of the prop with the fastest shutter speed my camera can achieve - a Canon 350D at about 1/3200'th of a second - so the prop is nearly stopped in that frame. On the right is a bit of fun, I took that one with my Nokia mobile phone and due to a quirk of the way the camera scans the light receptor it seems like the otherwise four-bladed prop on the Metro has something like ten blades, all in strange places! All manner of odd freight gets carried around the country in the old Metros. 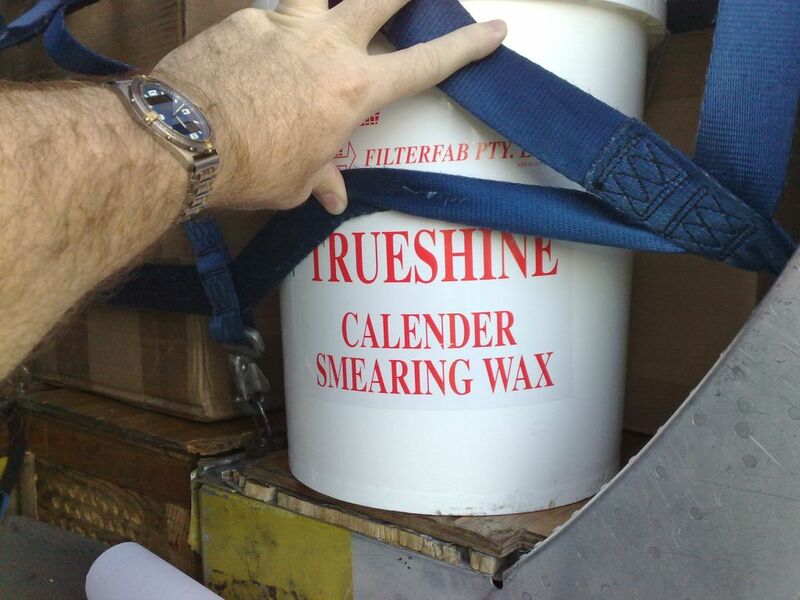 So remember the next time you look at your nice shiny calender, it may well have been waxed by the bucket of goo we once took on my plane. 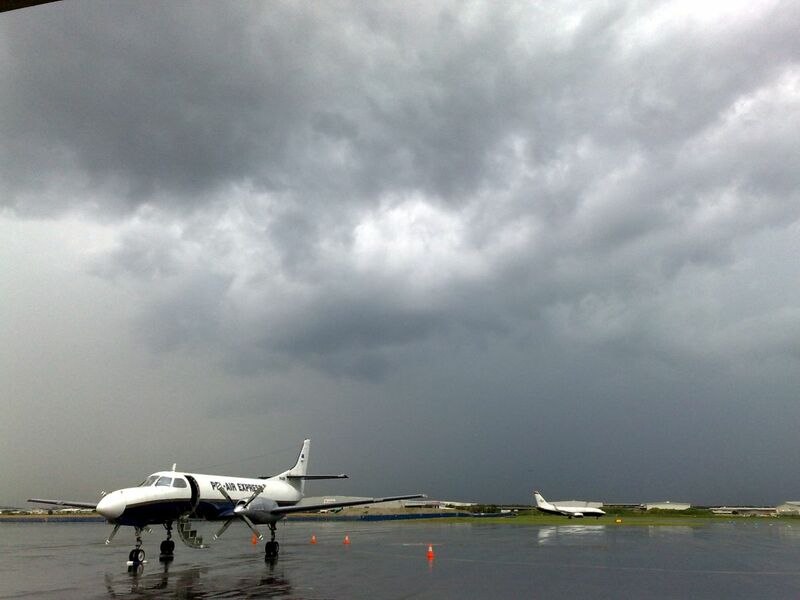 Part of living in Australia and being a pilot means that in summer you often have to deal with poor weather. 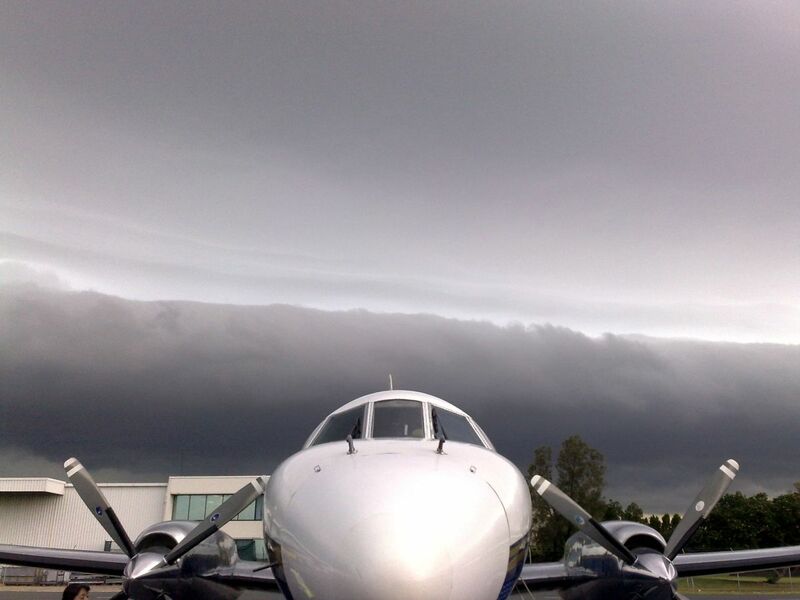 On this day a huge front came through Brisbane shortly before we were due to leave on a run to Sydney & back. Fortunately most of it had passed by the time we taxied off and I could see a gap that we escaped through. The radar in the Metro's was terrible at best and I really had to call on a lot of experience to try to figure out the best way through a lot of it - and sometimes that wasn't enough and we'd get hammered anyway. One day I was putting some water ballast in the tail of the Metro before we did the short Melbourne to Essendon trip empty, as the Metro's are often quite nose-heavy when empty and require a fair bit of ballast in the tail to make the centre of gravity move to where it needs to be and being a casual scientist I wondered how tall a stack of 15 litre/kilogam water bottles would be. Since a human is close to a specific gravity of 1.0, I figured that the stack would be pretty close to as tall as me. 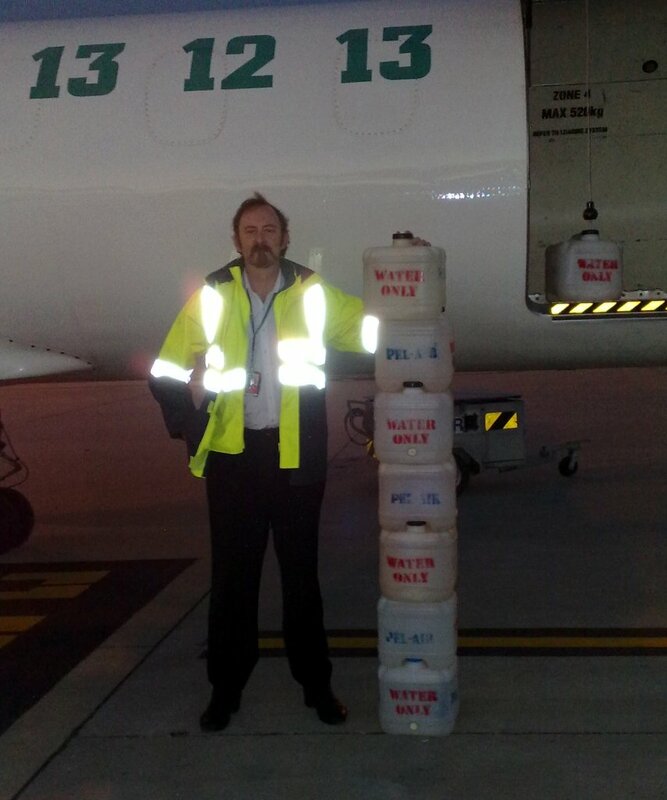 So I stacked up 105kg of water and it was no surprise that it really was close to my height. The things you do to amuse yourself in a cold windy winter in Melbourne. I wondered if the video capture function on the phone would also produce the same effect as the stills camera, and as it turned out it did, and here's some Youtube videos showing it. thus making the airpseed drop right down to a very low level. It'd normally be showing more like 180kts there. 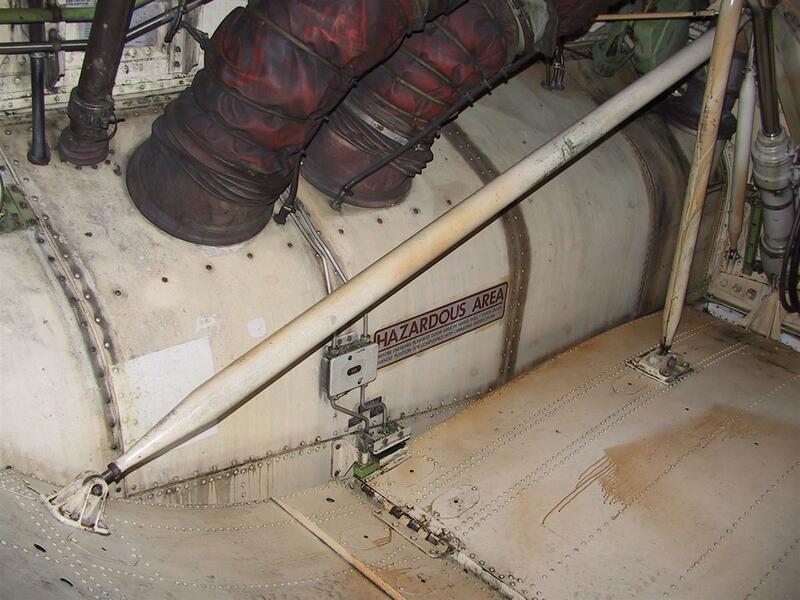 The door seals - to keep the cabin air pressure in - also sometimes played-up. This one played us a good tune!